Brig. Gen. William A. Spangenthal is the Director of Operations and Communications, Headquarters Air Education and Training Command, Joint Base San Antonio, Texas. He is responsible for developing policies and programming resources for Air Force technical and aircrew training programs including enlisted accessions; initial skills and undergraduate flying training for active, Reserve and Guard personnel; Euro-NATO Joint Jet Pilot Training; and non-rated supplemental training. Along with formulating training policy, he maintains the ability to respond to contingency and expeditionary requirements. 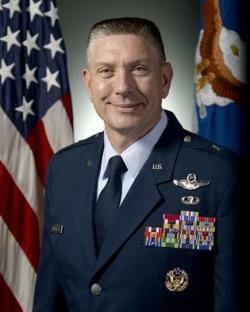 General Spangenthal graduated from the U.S. Air Force Academy in 1992. He has commanded at the squadron, expeditionary group, and wing levels. Additionally, he has held a variety of joint, major command and headquarters staff positions. General Spangenthal is a command pilot with more than 3,300 flying hours in the T-37, T-38, C-12, KC-135 and C-17. Prior to his current assignment, he served as the Director, Plans, Programs, Requirements, and Assessments, JB San Antonio-Randolph, Texas. 1992 Bachelor of Science, operations research, United States Air Force Academy, Colo.
2000 Master of Arts, organizational management, The George Washington University, Washington, D.C.
2003 Air Command and Staff College, Maxwell AFB, Ala.
2004 School of Advanced Air and Space Studies, Maxwell AFB, Ala.
2009 Secretary of Defense Fortune 500 Fellow, Apple Inc., Cupertino, Calif.
1. October 1992 - October 1993, undergraduate pilot training, Vance AFB, Okla.
2. February 1994 - May 1998, instructor pilot KC-135R, Executive Officer, Grand Forks AFB, N.D.
3. July 1998 - July 2000, Air Force intern, the Pentagon, Arlington, Va.
4. February 2000 - May 2003, evaluator pilot C-17A, Wing Executive Officer, Charleston AFB, S.C.
5. May 2003 - June 2004, IDE student, Air Command and Staff College, Maxwell AFB, Ala.
6. June 2004 - June 2005, student, School of Advanced Air and Space Studies, Maxwell AFB, Ala.
7. July 2005 - June 2007, Chief, Future Concepts Section, Scott AFB, Ill.
8. June 2007 - June 2009, Commander, 21st Airlift Squadron, Travis AFB, Calif.
9. June 2009 - June 2010, Secretary of Defense Fortune 500 Fellow, Apple Inc., Cupertino, Calif.
10. June 2010 - June 2012, U.S. Transportation Command liaison to U.S. Central Command/U.S. Southern Command, MacDill AFB, Fla.
12. June 2013 – June 2015, Commander, 97th Air Mobility Wing, Altus AFB, Okla.
13. July 2015 – April 2017, Director, Secretary of the Air Force and Chief of Staff of the Air Force Executive Action Group, the Pentagon, Arlington, Va.